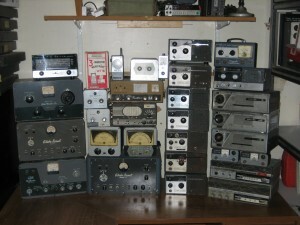 World Radio Laboratories, WRL, was a major supplier of amateur radio equipment from the 1950s through the 1970s. WRL was located in Council Bluffs, Iowa, and run by Leo Meyerson (W0GFQ) and his family. The Globe emblem first appeared on products made by World Radio Labs with the 1948 model Globe Champion transmitter. In 1960, the Globe line was sold to Textron. Globe/Textron and RME/Electrovoice merged in 1962, with the result named GC Electronics, a division of Textron. Division of Textron Electronics, Inc.
WRL Globe AT-3 – Matcher Jr.